Daryl Johnson (Worcester Park, United Kingdom) on 16 October 2008 in Architecture and Portfolio. Beautiful composition Mirko and I love the shape of the roof and that sky is wonderful too....what a great photo! @Ian Bramham: Cheers Ian! But who / what is Mirko!? You have desaturated some parts of the picture. The roofs around the pagoda on the left and the balconies and balustrades stands out in the picture. May be it is what you wanted to show? @akarui: Olivier, actually the original was very dark and I lightened it, did some dodging and burning. I didn't apply any desaturation, although the high pass sharpening did drain some colour. I am e-mailing you the original for comparison! Thanks! What an impressive construction! Nice composition. @Peter Knoop: Thank you Peter. Ah, the 7mm lens is really paying off in this shot! @Hoshisato: Thanks Hoshisato... is that good then? From this view it is quite a large building..
@Observing: It is very large Mike. The balcony can get very crowded with tourists. Thats a massive structure, what a grand presence it commands. @Richard_Irwin: It's a very impressive place Richard. I can see that it needed some more light, good work! It's really tough tell if this is b&w or color. I love it! This is such an impressive place. Beautiful structure and of course your framing is so perfect. That's an impressive building location. Makes me think of the Twilight Samurai. 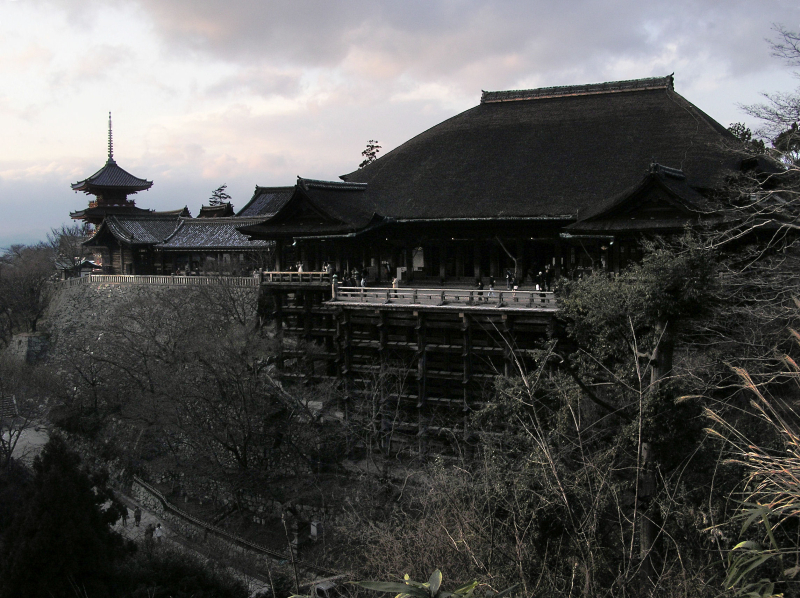 @Twelvebit: It's one of the most famous temples in Kyoto, and Japan.